Citation: Mahmood T, Mujtaba Nassiri MCH, Mohamed O, et al. Diaphyseal Tuberculosis of Tibia-Rare Occurrence: Case Report and Review of Literature. J Bone Rep Recommendations. 2016, 2:3. Skeletal tuberculosis is less common as compared to pulmonary tuberculosis. The incidence of Osteo articular tuberculosis is 1-3%. Of these, spine and hips involvement is more frequent. Long bones Diaphyseal tuberculosis incidence is extremely low even in endemic regions, but particularly in the Western countries. The paucity of specific nature of the symptoms usually results in a late diagnosis. The indolent nature of disease puts a great challenge to clinicians in diagnosing Diaphyseal tuberculosis of long bones accurately. Differential diagnosis of a solitary lesion in the diaphysis of the long tubular bone includes Brodie’s abscess, cystic bone lesions, bone tumors, chronic pyogenic osteomyelitis or fungal/bacterial granulomatous lesions. Because of such varied clinical and radiological presentations, the diagnosis requires a high index of suspicion and usually establishes through biopsy and culture. We reported this case to emphasize the unusual occurrence of long bones tubercles among immigrants to Western Countries as in our patient. A 25-year-old Man immigrant from Asia presented with chronic leg pain and swelling. He responded poorly to anti tuberculosis medical treatment due to noncompliance. His X-ray, CTscan and MRI Scans revealed a lytic lesion in lower shaft of tibia. Percutaneous CTguided biopsy of the lesion was done. Following curettage, tubercles osteomyelitis was diagnosed from obtained sample. Cementing of curettage cavity was done with newer version of antibiotic impregnated biodegradable cement. On Anti TB medical treatment, symptoms alleviated rapidly. Every second, someone on the planet is newly affected by Mycobacterium tuberculosis . World Health Organization reported that 9 million new cases of tuberculosis were diagnosed worldwide in 2013 . Skeletal tuberculosis is reported in Egyptian mummies dating back to 9000 BC [2,3] and 483 pre-Columbian skeletons in Chile . Subsequently, molecular studies have established the presence of Mycobacterium tuberculosis complex DNA in ancient bony specimens [3,5]. Skeletal TB entails for 10-35% of cases of extra pulmonary tuberculosis, and 2 percent of all TB cases [6,7]. Incidence of extra pulmonary TB is higher among immigrants from endemic areas to developed countries . Extra pulmonary tuberculosis (EPTB) has increased, in Europe and USA, from 7.6% of all Tuberculosis cases in the 1960s to 20-40% in recent studies [7,9,10]. This increase has been attributed to the epidemic of AIDS, a condition that predisposes to EPTB, homelessness, intravenous drug abuse and to immigration from Asian and African countries [7,9-11]. 58- 81% of skeletal TB cases are reported in immigrants in developed countries  and in 10% of EPTB cases occur in HIV-infected patients . There is a bimodal age distribution for bone and joint tuberculosis cases: In natives of developed countries, the disease commonly affects people older than 55 years, whereas in immigrants, it is more common in younger individuals (20- 35 years old) [7,9-11]. In England, Wales, and Northern Ireland, bone and joint TB accounted for 2.4% of all TB cases in children in the 7-year study period (1999-2006) [11,12]. Up to 50% of the extra pulmonary tubercular infections occur in the spine [11,12]. While the most common site of osseous involvement is the spine, followed by the femur, tibia and the small bones of the hands and feet, any bone can potentially be affected [13-18]. Tuberculosis can involve any bone, but it is rare in the Ischia, pubic bones , sternum , coccyx . Tuberculosis of the shaft of tubular bones makes up less than 1% of all cases of skeletal tuberculosis . Long weight-bearing bones are usually affected, knee or hip arthritis is relatively common, and femoral disease (including trochanteric tubercles bursitis) is not rare . Among 30 cases of atypical skeletal tuberculosis in multiracial immigrants in the United Kingdom, only two cases involved the shaft of tubular bones, and in both cases, the disease was widespread and not limited to a single tubular bone [23,24]. Harries and et al. reported 18 cases of extra spinal tuberculosis cases in children involving humorous, ulna, scapula, acetabulum, femur, tibia and calcaneus . Talbot et al. conducted a 6 yrs. review of skeletal tuberculosis in one region of UK and reported that 73% of cases in their study who has skeletal tuberculosis were immigrants from the Indian subcontinent and 18% were UK born Asian, Only 2 out of 82 patients in their review had tuberculosis of long tubular bones. Very few cases of primary Diaphyseal tuberculosis of tibia have been reported from Asia where disease incidence is high [25,26]. In our case, the patient was an adult of Pakistani origin and the site of involvement was the lower 1/3 tibia. A 28-year-old man presented to the outpatient clinic with pain and swelling of the left leg for the last eight months. There was no history of injury. For the last seven months, he had a lowgrade evening rise of temperature. The pain had progressively worsened during the day but did not disturb his sleep at night. The pain was not relieved by analgesics. Pain was worse on standing and walking. There was no history of cough, expectoration, hemoptysis or other joint involvement. Past history of enlarging tender left parietal swelling of scalp with erosion of parietal bone without intracranial structure involvement was diagnosed as tuberculosis of scalp on CT scan, MRI of brain. There was another mildly tender swelling developed in right lateral thoracic wall. CT scan of thorax, abdomen and pelvis was performed that showed; Lungs were clear. The visualized skeleton was normal. There was pathological excess soft tissue in the sub-cranial compartment represent lymph node enlargement. There was a necrotic appearing 2.5 × 1.5 cm diameter subcutaneous focus anterolateral at the level of the inferior blade of the right scapula in the subcutaneous fat. Liver, pancreas and both kidneys were unremarkable. There was no free peritoneal fluid or free peritoneal air or abdominal or pelvic lymph node enlargement. Ultrasound guided biopsy of thoracic swelling was done. Anti-tubercles treatment resolved scalp and thoracic wall swellings followed by appearance of left leg swelling. He had no history of major illnesses such as renal failure, pulmonary tuberculosis, diabetes mellitus, repeated blood transfusion suggestive of congenital hemolytic anemia, was absent. The family history was non-contributory. The patient was conscious, alert and cooperative. He was not malnourished, afebrile and haemo-dynamically stable. There was a 6 cm × 4 cm painful tender swelling over the medial aspect of the lower one-third of the left leg. It was firm in consistency, without any fixity to the skin and had a normal local temperature. There was mild edema of the overlying skin, but no discharge or pus from the lesion. The left ankle joint was normal. There was no swelling, tenderness or any restriction in the range of movement of ankle. Examination of the other systems was also normal. Routine laboratory workup revealed that the erythrocyte sedimentation rate was 56 mm in the first hour. Hemoglobin level was 9.8 g/dL. The full blood count showed normocytic normochromic anemia, and a normal total and differential white cell count. The Monteux test was normal. The renal and liver function tests were also normal. The fasting blood sugar level was 77 mg/dL. Serology for hepatitis B and C as well as HIV were negative. Radiograph of the chest was normal. Radiograph of the left tibia revealed a thickening of the medial cortex of the lower shaft, with an intracortical lytic bone lesion associated with sclerosis of the affected bone segment. Mild swelling of the overlying soft tissue was also noted (Figure 1). MRI Scan of the leg confirmed the presence of a thickened cortex due to end steal new bone formation (Figures 2-4). The intramedullary lytic bone lesion contained a central small sequestrum. The marrow of the affected bony part showed increased density and enhancement, suggesting vascular granulation tissue. Mild edematous thickening of the adjoining soft tissue was also noted (Figures 1-3). The clinical features, radio graphical appearance and MRI findings were suggestive of Diametaphyseal tumor or chronic infective lesion. CT guided Biopsy of the lesion done that proved tuberculosis. 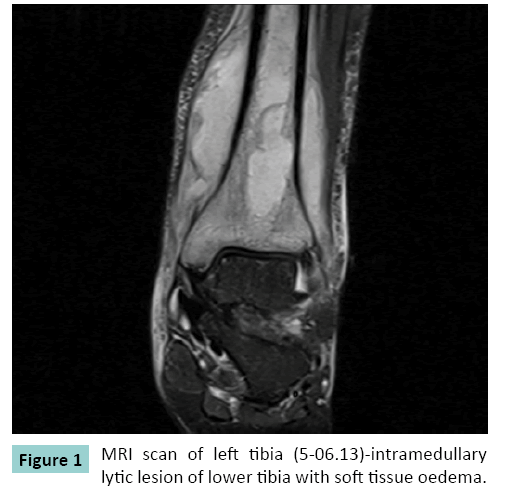 Figure 1: MRI scan of left tibia (5-06.13)-intramedullary lytic lesion of lower tibia with soft tissue oedema. 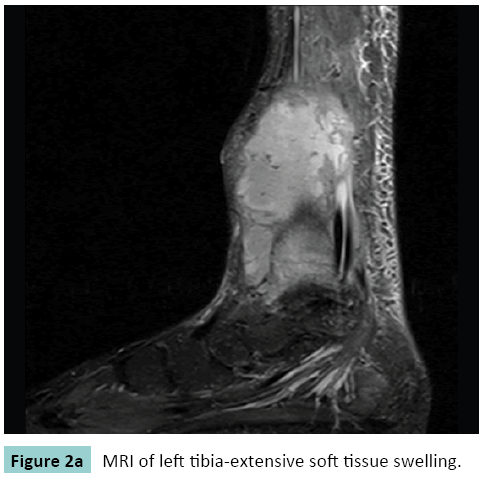 Figure 2A: MRI of left tibia-extensive soft tissue swelling. Figure 2B: MRI scan of left tibia-lytic lesion extending in lower metaphysic and in surrounding tissue. 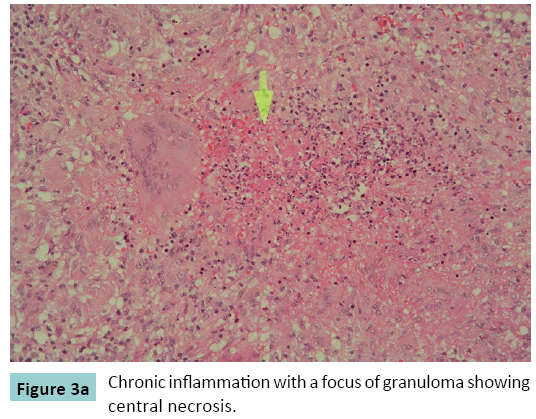 Figure 3A: Chronic inflammation with a focus of granuloma showing central necrosis. Figure 3B: MRI scan of left tibia. 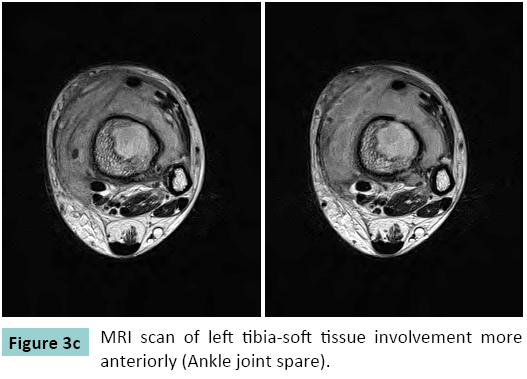 Figure 3C: MRI scan of left tibia-soft tissue involvement more anteriorly (Ankle joint spare). 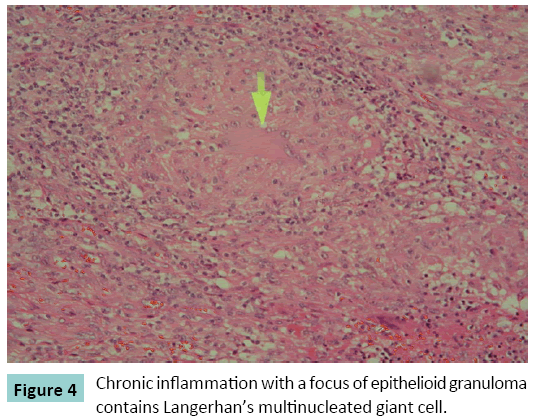 Figure 4: Chronic inflammation with a focus of epithelioid granuloma contains Langerhan’s multinucleated giant cell. Exploration and Curettage of lesion was performed and the cavity filled with newer version of antibiotic impregnated cement. The histological examination of the obtained necrotic material revealed well-formed epithelioid granuloma interspersed with characteristic giant cells in the background of eosinophilic gaseous material, characteristic of tubercular osteomyelitis (Figures 3 and 4). 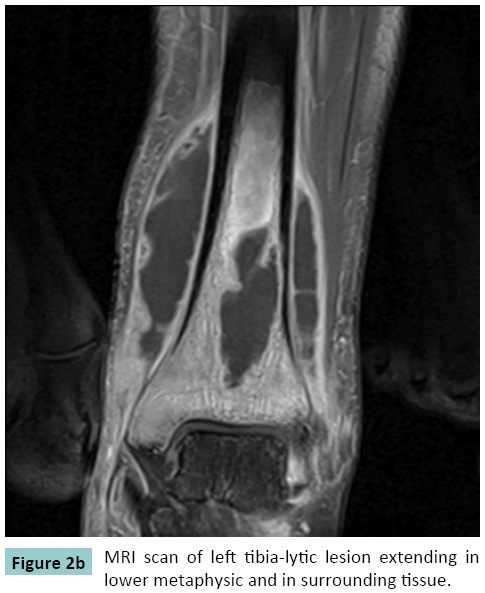 The final diagnosis was isolated Diaphyseal tubercles osteomyelitis of the left tibia. The patient was offered standard three drug anti-tubercles regimen comprising rifampicin 450 mg (R), isoniazid 300 mg (H) and ethambutol 800 mg (E), daily initially for two months (RHE), followed by a seven-month course of two drugs (HR). The patient recovered well without any deformity or restriction of movement, and was under regular follow-up for three years postoperatively. X-rays of tibia taken after two years showed healing of lesion (Figures 5a-5c). 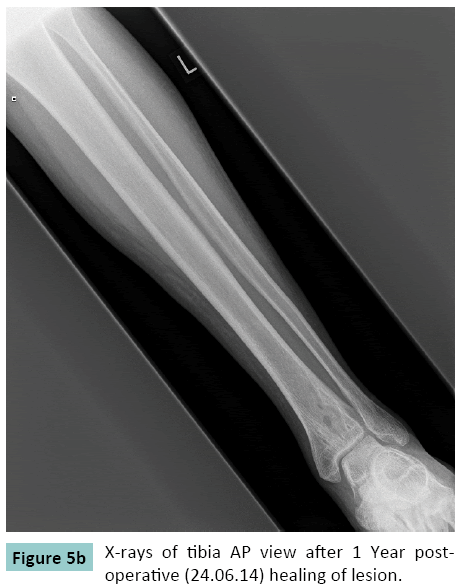 Figure 5A: Preoperative x-rays showing lytic lesion in lower tibia. 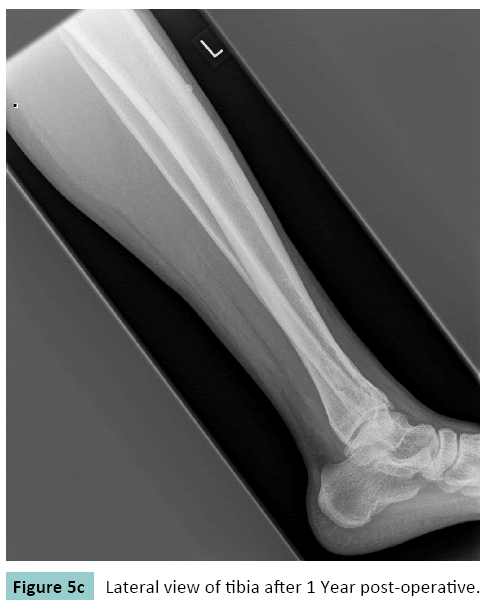 Figure 5B: X-rays of tibia AP view after 1 Year postoperative (24.06.14) healing of lesion. Figure 5C: Lateral view of tibia after 1 Year post-operative. The most common presenting symptoms of tubercles osteomyelitis are non-specific pain and swelling. Consequently, as in the above case, skeletal tuberculosis frequently mimics osteosarcoma, leading to incorrect initial diagnosis and delay in the institution of treatment. Extra pulmonary tuberculosis is one of the great mimickers of medicine, and often Masquerades as malignancy. Despite increasing awareness and the availability of better imaging and other diagnostic tests, extra pulmonary tuberculosis remains a difficult diagnosis to make, due to its often non-specific and protean manifestations. Therefore, the prompt recognition by clinicians of distinguishing features is vital for correct diagnosis, to facilitate timely anti-tubercles therapy. In particular, imaging is a key tool in helping to make the diagnosis of extra pulmonary tuberculosis, through the recognition of certain key radiological patterns. However, as there are no pathognomonic imaging findings, the diagnosis ultimately rests on histological and microbiological confirmation. Whilst in the past this necessitated open surgical biopsy, tissue samples can now be obtained with minimal invasion, under image-guidance. Extra spinal tubercles osteomyelitis presents as a cold abscess, with swelling and only mild erythema and pain, and may be misdiagnosed as a tumor. It is not uncommon for this disease to mimic malignancy. For instance, skeletal tuberculosis can clinically simulate Brodie’s abscess, cystic bone lesions, bone tumors, chronic pyogenic osteomyelitis or fungal/bacterial granulomatous lesions, and even sarcoma. The earliest manifestation is pain, which may precede signs of inflammation for weeks or months. Fever and systemic symptoms are usually absent. Radiography may initially show soft tissue swelling, but later osteopenia, periosteal thickening, and per articular bone destruction is observed. Cold abscesses and fistulae develop in late cases. Chest radiography shows pulmonary disease in onethird to one half of cases, but active pulmonary TB is infrequent . The early stages are often misdiagnosed, and the joint disease is attributed to traumatism, degenerative disease, gout or pseudo gout, rheumatic disease such as rheumatoid arthritis, or pigmented villonodular synovitis. The diagnosis requires a high index of suspicion and is usually established through arthrocentesis, biopsy of lesion and mycobacterial culture; however, synovial biopsy is often needed. In early cases, prolonged anti tubercles therapy results in complete resolution. Surgery is necessary in advanced cases, which may require arthrodesis or arthroplasty of the joint. A solitary lesion in the diaphysis of the long tubular bone may mimic chronic pyogenic osteomyelitis, Brodie’s abscess, cystic lesions, tumors or granulomatous lesions, either fungal or bacterial [27,28]. Solitary cystic tubercular lesion of the diaphysis is particularly common in children [29,30]. In a primarily Diaphyseal intracortical lesion, as in our case, it is essential to exclude osteoid osteoma, intracortical haemangioma and type three Brodie’s abscess . A particular type of tubercles osteomyelitis, cystic tuberculosis, produces round or oval radiolucency’s with variable amounts of sclerosis . These findings are, however, non-specific, and can be found in a range of pathological processes, including neoplasia. There are a few radiographic features, however, that favor tubercles infection over neoplastic. These include the presence of small juxtacortical abscesses or rings of inflammatory tissue, due to cortical destruction and spread of infection to the extra osseous tissues. Regardless, the features of tubercles osteomyelitis are so variable and inconstant that further investigation is usually required. Our patient was an adult, and the absence of response to salicylates made the diagnosis of osteoid osteoma unlikely. The absence of characteristic intra-cortical contrast enhancement in MRI ruled out the possibility of haemangioma. His bone pain that did not respond to simple analgesics may have been of infective or neoplastic etiology. There are no specific radiographic features of tubercles osteomyelitis. Signs like osteoporosis, bone lysis, sclerosis, and periostitis are seen in both tubercles and pyogenic osteomyelitis, often making it difficult to differentiate these conditions. Sometimes, the radiographic findings are similar to those in Brodie’s abscess . The definitive diagnosis of spinal TB is usually established by CT-guided needle aspiration cytology-biopsy and culture on Lowenstein medium (sensitivity of 50-75%), or by histological examination, which is highly suggestive of spinal TB when CA seating granulomas are observed and diagnostic when acid-fast bacilli are found (sensitivity around 70%). 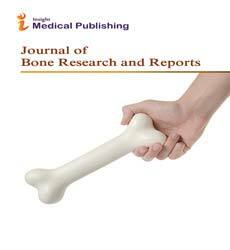 Culture and histological study of a bone specimen obtained by surgery has a slightly higher diagnostic yield . In a primarily Diaphyseal intracortical lesion, as in our case, it is essential to exclude osteoid osteoma, intracortical haemangioma and type III Brodie’s abscess. Tuberculosis of tibial diaphysis is very rare in Western Countries but high index of suspicion is required in patients of Asian or African origin with chronic inflammatory swelling over the leg with fewer or none constitutional symptoms. Anti-tubercles treatment is mainstay of treatment. In advance cases with impending fracture or poor compliant patient to medical treatment, newer technique of curettage and antibiotic impregnated cementing of cavity is a viable option and assist in healing of lesion with anti-tubercles medical treatment. Raviglione M, Floyd K, Baddeley A (2014) WHO Global Tuberculosis report. World Health Organization, Geneva, Switzerland. Daniel TM, Bates JH, Downes KA (1994) History of tuberculosis. In: Bloom BR (ed.) Tuberculosis: Pathogenesis, Protection, and Control. American Society for Microbiology, Washington. Hershkovitz I, Donoghue HD, Minnikin DE, Besra GS, Lee OY, et al. (2008) Detection and molecular characterization of 9,000-year-old Mycobacterium tuberculosis from a Neolithic settlement in the Eastern Mediterranean. PLoS One 3: 3426. Arriaza BT, Salo W, Aufderheide AC, Holcomb TA (1995) Pre-Columbian tuberculosis in northern Chile: molecular and skeletal evidence. Am J PhysAnthropol 98: 37. Donoghue HD, Lee OY, Minnikin DE (2010) Tuberculosis in Dr Granville's mummy: a molecular re-examination of the earliest known Egyptian mummy to be scientifically examined and given a medical diagnosis. ProcBiolSci 277:51. Watts HG, Lifeso RM (1996) Tuberculosis of bones and joints. J Bone Joint Surg Am 78: 288-298. Peto HM, Pratt RH, Harrington TA, LoBue PA, Armstrong LR (2009) Epidemiology of extrapulmonary tuberculosis in the United States. Clin Infect Dis 49:1350. Pertuiset E, Beaudreuil J, Lioté F,Horusitzky A, Kemiche F, et al. (1999) Spinal tuberculosis in adults. A study of 103 cases in a developed country. Medicine 78:309. Gunal S, Yang Z, Agarwal M, Koroglu M, Arici ZK, et al. (2011) Demographic andmicrobial characteristics of extrapulmonary tuberculosis cases diagnosed in Malatya, Turkey. BMC Public Health 11: 154-161. Jutte PC, Louenhout-Royackers JH, Borgdorf MW, Horn JR (2004) Increase of bone and join tuberculosis in the Netherlands. J Bone Joint Surg 86:901-904. Talbot JC, Bismil Q, Saralaya D, Newton D, Frizzel RM, et al. (2007)musculosketetal tuberculosis in Bradford; a 6 years review. Ann R CollSurgEngl 89: 405-409. Pigrau-Serrallach C, Rodríguez -PardoD (2013) Bone and joint tuberculosis. Eur Spine J 22: 556-566. Holland TS, Sangster MJ, Paton RW, Ormerod LP (2010) Bone and join tuberculosis in children in the Blackburn area since 2006: a case series. J Child Orthop 4:67-71. Engin G, Acuna B, Acuna G, Tunaci M (2000) Imaging of extrapulmonary tuberculosis. RadioGraphics 20:471-488. Davidson P, Horowitz I (1970) Skeletal tuberculosis. Am J Med 48:77-84. Harisinghani MG, McLoud TC, Shepard JO, Ko JP, Shroff MM, et al. (2000) Tuberculosis from head to toe. RadioGraphics 20:449-470. Martini M, Quahes M (1988) Bone and joint tuberculosis: a review of 652 cases. Orthopedics 2:861-866. Moon MS (1997) Tuberculosis of the spine. Spine 22:1791-1797. Moore SL, Rafii M (2001) Imaging of musculoskeletal and spinal tuberculosis. RadiolClin North Am 39:329-342. Gopal K, Raj A, Rajesh MR, Prabhu SK, Geothe J (2007) Sternal tuberculosis after sternotomy for coronary artery bypass surgery: a case report and review of the literature. J ThoracCardiovascSurg 133: 1365-1366. Hsieh CK, Miltner LJ, Chang CP (1934) Tuberculosis of the shaft of the large long bones of the extremities. J Bone Joint Surg Am 16:545-563. Elmi A, Tabrizi A, Tolouei FM (2013) Skeletal Tuberculosis Presenting as a Small Cystic Lesion in the Medial Femoral Condyle.Arch Bone JtSurg1: 112-115. Hosalkar HS, Agrawal N, Reddy S,Sehgal K,Fox EJ, et al. (2009) Skeletal tuberculosis in children in the Western world: 18 new cases with a review of the literature. J Child Orthop 3: 319-324. Chattopadhyay P, Bandyopadhyay A, Ghosh S, Kundu AJ (2009) primary Diaphyseal tuberculosis of tibia.Singapore Med J 50: 226. Mathew K,Paulose S, Jose TM (2013) Tuberculosis of proximal Tibia. Kerala Journal of Orthopaedics 26:51-52. O’Connor BT, Steel WM, Sanders R (1970) Disseminated bone tuberculosis. J Bone Joint Surg Am 52:537-542. Abdelwahab IF, Present DA, Gould E, Klein MJ, Nelson J (1988) Case report of 473: Tuberculosis of the distal metaphysis of the femur. Skeletal Radiol 17:199-202. Resnick D, Niwayama G(1988) Diagnosis of Bone and Joint Disorders. Philadelphia: Saunders2: 226-268. Rasool MN, Govender S, Naidoo KS(1994) Cystic tuberculosis of bone in children. J Bone Joint Surg Br 76:113-117. 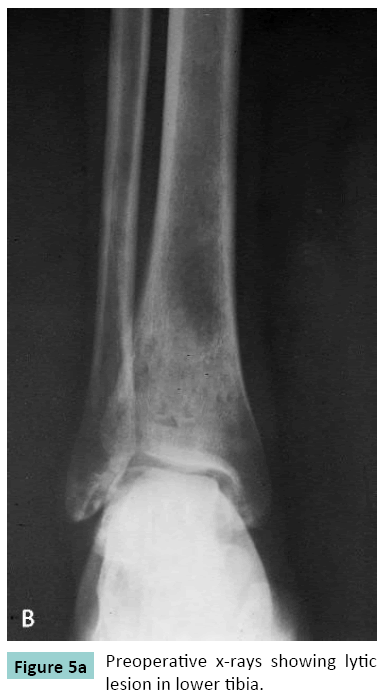 Roberts JM, Drummond DS, Breed AL, Chesney J (1982)Subacutehematogenous osteomyelitis in children:a retrospective study. J PediatrOrthop 2:249-254. Griffith JF, Kumta SM, Leung PC (2002) Imaging of musculoskeletal tuberculosis: a new look at anold disease. ClinOrth Related Res 398:32-39. Colmenero JD, Jime´nez-MejÃÂ±´as ME, Reguera JM, Palomino-Nica´s J, Ruiz-Mesa JD, et al. (2004) Tuberculous vertebral osteomyelitis in the new millennium:still a diagnostic and therapeutic challenge. Eur J ClinMicrobiol Infect Dis 23: 477-483.